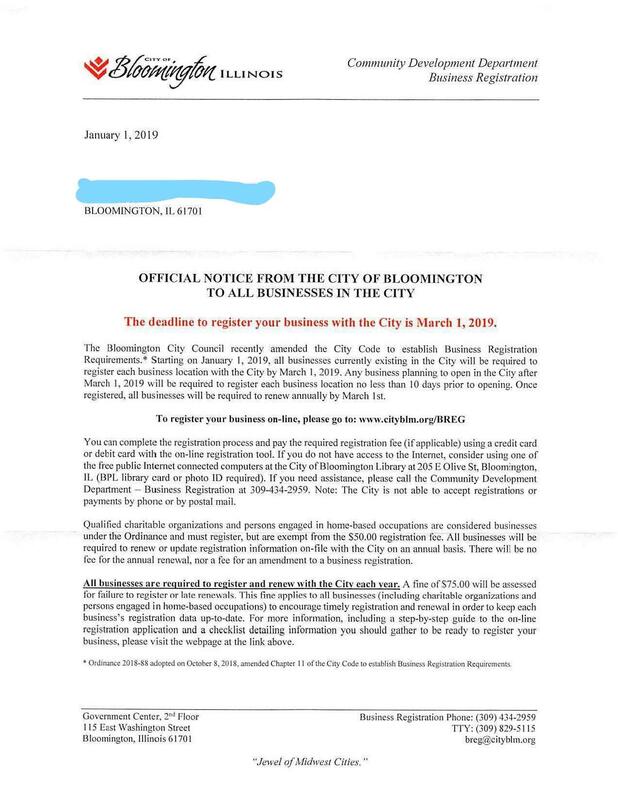 Bloomington’s Business Registration is here! Bloomington finally managed to hack off virtually every business in town. So far today I’ve talked to 3 business owners who got the letter below. This Business Registration has nothing to do with public safety, it’s an attack on the local producers. How did Bloomington send each business a letter if they didn’t know they existed? Doesn’t that prove they already do? The Guide is 5 pages, the registration form is 21 pages long. After all the information is entered on-line (the directions say if you don’t have a computer to go to the library and use one of theirs), you have to wait 4-5 days for somebody in the Community Development Department to approve your application. Then you can log on again and pay the $50 fee. Don’t bother calling the phone number listed – it will go to voice mail. One guy called yesterday morning, left a message, and still hasn’t been called back. Charitable organizations and home based businesses still have to register, but they don’t have to pay the $50.00 fee. A $75.00 late fee will be added if businesses don’t complete the registration by March 1st. Fees will continue to accumulate up to $1000.00 for failure to comply. Food trucks are also exempt. New businesses have to register before they open. The guys I talked to claim it will take them at least an hour to complete the application. That doesn’t include waiting to be approved before going back to pay. There is even a section asking about their parking lot, including when it was first used and the dimensions. The purpose of registering is tyranny. The new zoning code (when passed) will be used to fine businesses. Instead of inspecting every business, they will use the information owners provide. The size of a parking lot has nothing to do with who to contact if your building is on fire. (Tari Renner’s reason for wanting the ordinance) The form also asks when your “fiscal year” is! NONE of YOUR BUSINESS Bloomington. The $50 fee is supposed to be just for the first year, even though businesses need to re-register every year. Next year it will likely double. This isn’t Community Development, it’s community destruction. Congrats. The same idiots now running Illinois are running Bloomington. Posted in BloNo, Bloomington, BLOOMINGTON CITY COUNCIL, elections, Liberal Media, Local, Progressives, Renner, Taxes, Tim Gleason.Tagged business registration, charitable organization, Community Development, food trucks, home based businesses, ZONING. The “Community Development Department”, could Renner & Co. be any more Orwellian?! Didn’t the establishment tell us that Bloomington-Normal is business-friendly?! I think it’s even written in BN Advantage and EDC propaganda brochures. These are the same buffoons in leadership that tell us we need to “buy local” and “shop downtown” to support local businesses. Well, Tari, who does this fee hurt the most? The answer is the local shop owner with low margins whose prices are typically higher than his/her big chain competitors or the online giants. Any word from the Chamber of (Crony) Commerce or are they too busy cashing taxpayer-funded government checks from the Gala? C’mon Chuckles, take a stand for business owners for once in your life. Any business that is looking to open/expand/move in B-N will most likely choose Normal instead of Bloomington. …at least until Normal decides to follow suit, because you know Koos will. IF my late father were still alive, he would SURELY have a comment about HOW this is VERY similar to Kristallnacht! Why are food trucks exempt? I thought this was for “business” registration. Personally I’m not a fan of more taxes and fees for anybody but if some businesses are exempt, then I call bullsheet! Tari’s transparency fails again. Deceive to achieve is Tari Renner’s main source of getting things done. IL Senate just passed the $15 minimum wage bill by 2025, on to the house. This will kill many small business owners. Great point, Old Stanky! Provided that Uptown and Downtown are still around in 2025, this will be the fatal blow to those remaining local brick-and-mortar retail and other businesses. It will also lead to more youth unemployment, which will hinder their ability to begin accumulating basic work skills (e.g. showing up on time, accountability, people skills, etc. ), the foundation of future professional growth and contribution to the local economy. I take no joy in stating this, but I counted eight “for sale” signs today on a five block trip to the grocery store. I doubt all of them are moving up in the housing market. I have also predicted with no glee that B-N will likely look like many other distressed cities in ten to fifteen years. As a wise man once said, liberalism is indeed a mental disorder. So, roughly 2-3% plus $0.25 per charge (business license fee) goes to the credit card companies. Awesome! That’s ILLEGAL, as RIGHT on a Federal Reserve Note (aka dollars) it READS: “This note is LEGAL tender for ALL debts, PUBLIC and PRIVATE.. I’d challenge THAT! Maybe ole rainbow Tari is printing his OWN “mug money”? Define the deference between this council and the James Gang. Well at best, the James gang would feed their horses, while the City fathers would call in a expert to study it and come back next month to let then know if that horse was really hungry. This may be one of the funniest posts I’ve read on here in a while! Very fitting description of City leadership. Businesses should give Tax’n Tari a little of his own medicine. Show up as a group at the city council meeting just like those wanting a welcoming city ordinance for illegals. Except this time make it a welcoming city for businesses to stay in town since they are here legally. Again those who try to legally be a part of this community get screwed, but ole’ Tari is too busy tax’n them, championing the cause for illegals and adjusting his rainbow sash. I wonder if Green Top Grocery will have to register? Or will they be exempt due to a loop hole? GTC is such a pet project of Bloomington! Maybe City Hall will do a chargeback on their credit card payment a couple of months from now when he thinks no one is looking or FOIAing. There’s PROBABLY a clause back on page 19 or so that a business ONLY has to register if it’s PROFITABLE, so that leaves out GTG, BCPA, Arena, etc, most ANYTHING that Tari has a hand in. Like Ole Stanky sez: Deceit to Cheat! Bloomington City government, the (failed) State of Illinois, and today’s National Democrat Party.. I moved to Indiana about 10 months ago. It was really eye opening to contrast between Bloomington/Normal IL to Columbus IN. One community has crumbling infrastructure, raising crime rate, high taxes and fees and business and people moving away. The other comunity has a solid infrastructure, relativity low crime rate, lower taxes and fees and bussiness and population expansion. I think you can safely say that the libtards have turned Bloomington/Normal into a shithole. …..and I’ll bet they don’t have local chapters of Black Lives Matter thugs and Antifa terrorists, either. Yes it is. Indianapolis and most of its surrounding communities are vibrant as well. Service is top-notch and people actually are polite and appreciate your business unlike the Chicago and hillbilly invaders that have taken over B-N. So do all the MLMs and people who sell things from Tupperware to oils to clothes to books have to register? Or only those who didn’t vote for Tari? So…….register with the City if you’re a business owner, paying taxes, employing people who pay taxes, providing goods and services………..BUT……….no need to register if you’re an illegal alien. In fact, we’ll give you free stuff and protect you from the cops and fed. A smack on cheek for effect. We are being governed by a criminal organization. Can we try not being governed? I think a yellow vest brigade is needed to get the roads fixed!